The right to work without fear for your life is a human right. The collapse of the Bangladeshi Rana Plaza building, which housed five garment factories, in 2013 drew a spotlight on to the terrible risks garment workers face simply going to work. The collapse, which killed 1136 workers, was the worst ever to hit the industry but it was by no means the first or the last. Millions of garment workers sewing clothes and making shoes for the UK high street do so in dangerous conditions. Poor regulation, a lack of factory inspectors and the purchasing practices of the brands mean corners are constantly cut on workplace safety and workers are paying the price with their health and, all too often, their lives. Fires caused by faulty electrics, boiler explosions and roof and building collapses caused by poor construction or hasty conversions of buildings never intended for industrial use are a regular occurrence. The failure of employers to provide fire extinguishers, emergency exits or adequate training to workers mean that when fires and collapses do happen workers are trapped inside, injured and killed. 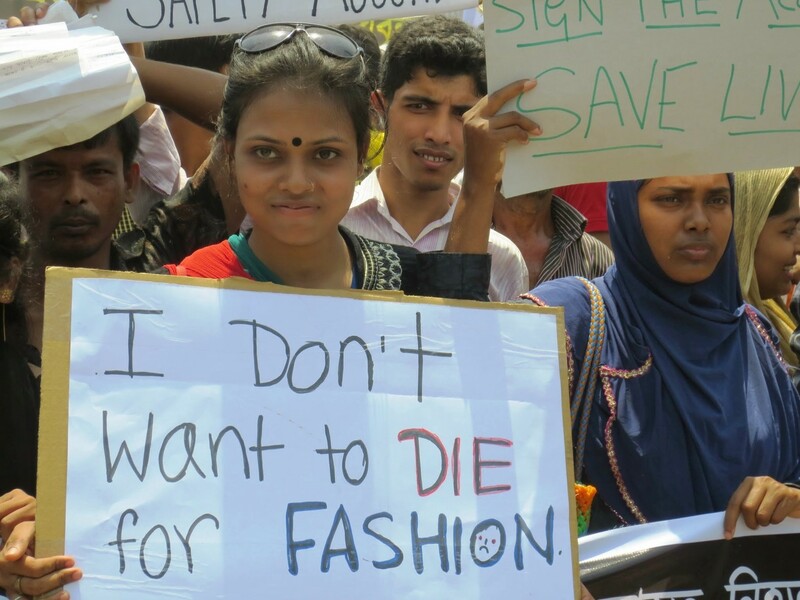 Hundreds of garment workers every year lose their lives at work. There are other hazards too. The use of dangerous chemicals and techniques, such as sandblasting, lead to long term and sometimes fatal illness; poor working conditions and long hours mean workers regularly suffer needle stick injuries, chronic back pain, respiratory problems, fainting and poor eyesight; women face sexual harassment and assault both in the factory and walking home after shifts that run late into the night. We believe that no worker should have to risk their health, their safety or their lives simply by going to work. We campaign for governments, brands and retailers and employers to take steps to make workplaces safe. We also campaign to ensure that, when the worst does happen, workers receive the medical and financial support they need to start rebuilding their lives. In a groundbreaking project, workers have come together as citizen journalists and have been recording their daily lives. Their films reveal how workers struggle to provide for their families, risk their health in unsafe conditions and put themselves in danger just by travelling to work. The deadliest industrial disaster in Pakistan’s history. Among the world’s worst ever factory fires. One clothing company responsible and still not held to account. On 11 September 2012, at around 6 p.m. the Ali Enterprises factory in Pakistan exploded into flames, claiming the lives of 254 people, and seriously injuring 55. The blaze spread quickly, engulfing people in flames. On the ground floor, workers were burned alive. On the second floor, where windows were barred, workers suffocated to death from the smoke. In the basement, workers remained trapped as hot water flowed from firefighters’ hoses, and were boiled alive. Some workers managed to escape merely by jumping from windows considered too high to require bars, in the four-story building. In the wake of the disaster, among the carnage and destruction also lay bundles of denim with German-language labels carrying German retailer KiK’s brand “Okay Men”. 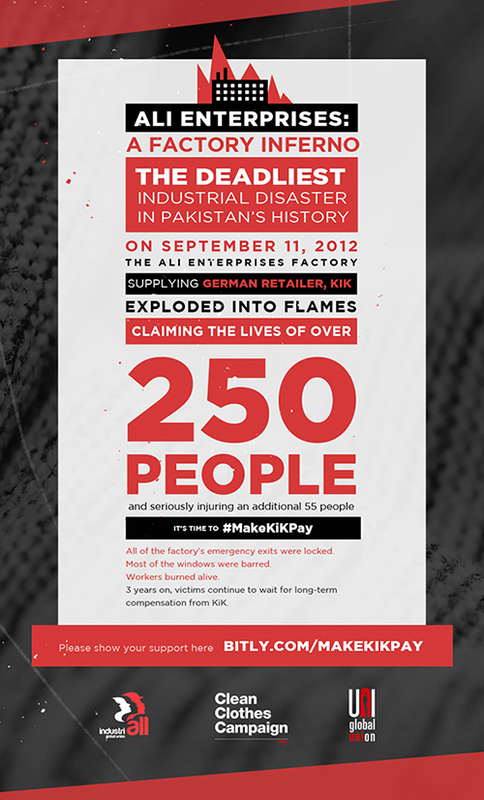 After the fire, it was revealed that the factory’s production was dedicated to making jeans for the German retailer KiK. It was also reported that plant managers forced workers to stay, ordering the gates closed, in order to try and save the company’s stock: piles of jeans destined for KiK stores. One survivor stated: “They prevented people from leaving, so they could save the clothes” – KiK’s jeans. KiK’s complete disregard for workers’ safety has cost thousands of lives in Pakistan and Bangladesh. It has a startling track record of sourcing from some of the most dangerous factories in the world. KiK is the only company in the world that has been linked to the worst three garment factory disasters in recent history – the Ali Enterprises factory fire in Pakistan; the Tazreen factory fire in Bangladesh (2012); and the Rana Plaza factory building collapse, also in Bangladesh (2013). A total of 1,500 garment workers are dead as a result of these tragedies. Thousands more were injured, and continue to battle with life altering injuries. As the fire ripped through the Ali Enterprises factory, workers were trapped in the building, behind barred windows and locked exit doors. Mohammad Saleem, 32, who broke a leg after jumping out of the second floor, said he and his colleagues were hard at work late Tuesday.“It was terrible, suddenly the entire floor filled with fire and smoke and the heat was so intense that we rushed towards the windows, broke its steel grille and glass and jumped out,” Saleem said. Another survivor, Allah Warayo, said there was a stampede as the fire spread. He ended up jumping from the third floor, but five members of his family did not escape. 254 people killed and 55 seriously injured. Emergency exits were blocked, doors were locked from the outside and bars were on the windows.